We hold expertise in the designing and manufacturing of fresh fruits & vegetable preparation plants that are provided with necessary machines and material handling Machinery for proper processing and then final packaging. These plants are integrated with a series of inter-connected machines that allow automatic and continuous operation of these plants with minimal manual intervention. The product is fed into the feed hopper of the elevator. It passes on to SS buckets. Since the buckets are overlapping the spillage of product is avoided. The buckets fitted with rollers at the end move along the SS path of the machine and are delivered to the next machine. SS overlapping buckets avoid spillage of the product. Perforated / non-perforated stainless steel buckets. The body of the elevator, tie rods, feed and discharge hopper etc are made out of S.S 304. The discharge height can range from 1500mm to 5000mm. Modular form for easy assembly at site. Sturdy construction and streamlined appearance. The product is fed into the feed hopper of the elevator. It passes on to Thermodrive belt. The belt moves along the carryway and discharges the product to the next machine at desired height. The product is fed into the feed hopper of the elevator. It passes on to plastic modular belt. The belt moves along the carryway and discharges the product to the next machine at desired height. Suitable for transferring the product from one point to another. Generally used as part of continuous processing food plant. PP support sheet on which the belt runs along the length of the conveyor. The support sheet is mounted on a framework made of SS angles. Drive arrangement consisting of geared motors, bearings, tensioning arrangement etc. Suitable for transferring product from one point to another with the help of a screw. Generally used for products in powder form or when the product is very difficult to handle like waste, sticky products etc. 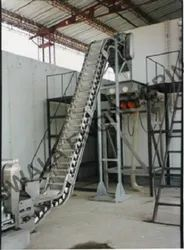 The product is fed in the feed hopper or at the feed end of the conveyor. Due to screw rotation the product moves forward and is discharged at the other end. 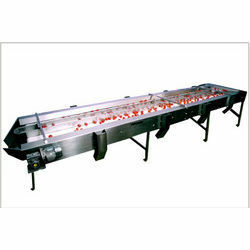 Conveyors can be straight or inclined depending upon the application. SS screw with screw flights welded on SS shaftTrough in which the screw rotates made with SS sheet/pipeSupports for the shaft after every few meters lengthSS stand for mounting the conveyor bodyDrive arrangement consisting of geared motor, bearings etc.